This article will guide you through the process of how to deploy/restore Windows 7 system image to dissimilar hardware using AOMEI Backupper and Image Deploy. Why Deploy/Restore Windows 7 System Image to New Hardware? Have you ever thought of why you need to restore Windows 7 system image to new hardware? Suppose you have just bought a new computer to replace the old one, the first thing you need to do is to install an operating system and necessary applications, which are time-consuming and energy-consuming. You may come up with the idea: "why not make a system backup image of the old computer directly, and then restore it to the new computer?" This may sound pretty effortless, but what if these two computers have different hardware configurations? It’s not hard to imagine that the new computer will encounter errors when boot up. So you need to find a safe way to carry out this deployment. Another assumption: if you are the administrator of the new established cybercafé or a company, you will face the headache problem of installing Windows 7 to numbers of computers. So it is urgent for you to find out the simplest way to save a lot. Luckily, technology makes things possible. You can only installing Windows 7 on one computer, then make a system backup, and deploy this system image to the rest computers for restoration. Here comes the question: how can you deploy Windows 7 system image to different hardware and guarantee the operability after the restoration? AOMEI Image Deploy (AID) is professional system image recovery software that specialized designed for Windows OS based machine. It intends to restore one system image to multiple computers that work in same LAN either with similar or dissimilar hardware. In theory, you place the system image on one computer which could be counted as a Server. Then boot all target/client computers from network by configuring that in BIOS. The rest is waiting for the recovery process to be completed. This is fairly helpful in companies, cybercafés, hospitals and schools. It has neat and graphical user-interface with easy operations. Download this software to learn the detailed steps. Create WinPE automatically: This will create a standard Windows PE ISO of your computer and store it to the installation directory of this software, and there is no user interaction inside. Create bootable WinPE ISO manually (Support adding custom drivers): This helps you add drives you might need to install on target/client computers to the Windows PE ISO. This AID plays greatest role only when there is large amount of computers need to be deployed. If you have just one or two PCs to restore, you may try following method: perform dissimilar restore via AOMEI Backupper. AOMEI Backupper puts forward a specially designed function called Universal Restore. This function can ensure new computers boot after system restoration, no matter the hardware configurations are the same or not. This freeware can be applied to Windows XP/Vista/7/8/8.1/10. The following are concrete steps. Situation 1: the target computer is a new one or can not boot directly. Install Backupper on the source computer. Backup Windows 7 to an external hard drive on the source computer. Create a bootable media on the source computer. Connect the external hard drive and the bootable media to a target computer, boot target computer. AOMEI Backupper pops out. Turn the interface to Restore and find the prepared Windows 7 system image by browsing Path. Tip: you can also seek help from PXE Boot Tool. With this tool you can boot many computers within LAN at the same time to realize Windows 7 restoration on different hardware. Situation 2: the target computers can boot. Install Backupper on every computer. Backup Windows 7 to shared network/NAS or to an external hard drive on the source computer. Launch AOMEI Backupper on the target computer(s), turn the interface to Restore. 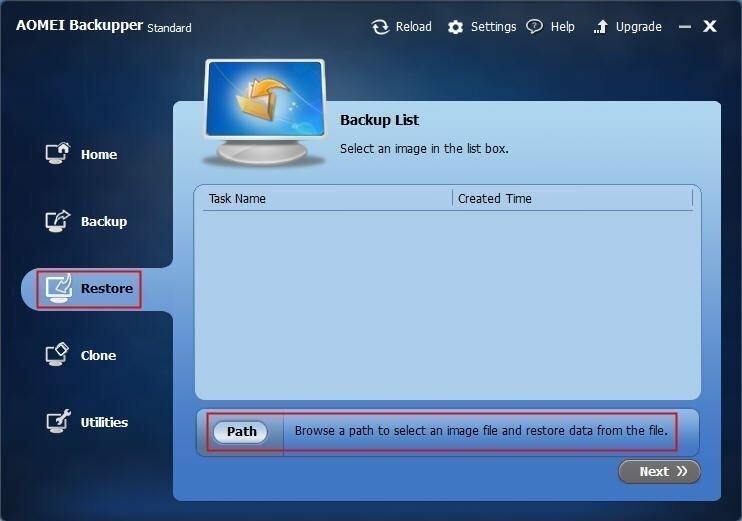 Find the prepared Windows 7 system image by browsing Path (If the image is stored on network/NAS, you are expected to find it under the corresponding path; if it is stored in an external hard drive, connect it to the target computer and make sure it can be detected by Backupper). Choose the destination. You can choose overwrite the original system, or not. Set the target computer to boot from new system. AOMEI Backupper is very smart software. When you are restoring a system image to a different hardware, it will automatically detect whether there is any difference on the hardware configurations. And if there is, AOMEI Backupper will automatically tick the Universal Restore option to guarantee the success. Now DOWNLOAD this freeware to have a try!